As I alluded to in my last post I’m currently working away from home, which means that I am getting significantly less workshop time that I usually would. That not withstanding, I am continuing to make progress on my Anarchist’s Tool Chest build, albeit at a slower rate than I ordinarily would like. With the exterior of the chest now milk painted and lacquered, I have turned my attention to the internal fit out of the chest, starting with the saw till and moulding plane corral. Having stocked up with plenty of pine and oak from my favourite local timber yard, I set to it. The saw till is comprised of three pieces; a dividing wall which separates the saw till from the main body of the chest, and the two tills, and I used 1″ thick pine for all three of these. The wall was glued up from two pieces which I jointed with my trusty No.5 jack plane and intentionally left over length. While the glue was drying on the wall I made the till pieces. These were cut to exact size (3 5/8″ wide, and 9″ tall), and have four slots, which hold the saws, running from the top edge to 4″ above the base. The position of the slots were laid out using dividers, which saved me having to do any maths. I then cut guide kerfs for each slot on the band saw. Before I brought the slots to final width, I shaped the top of the till pieces. 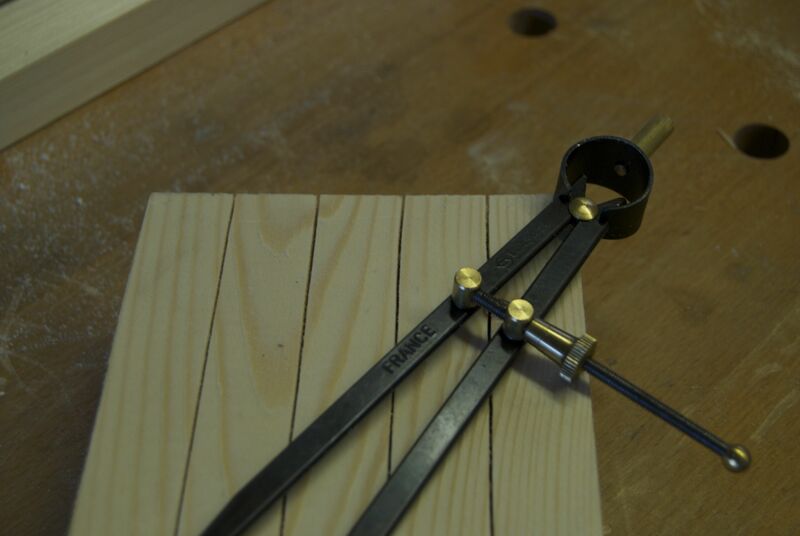 As with the saw slots, this was done by eye; setting a compass at the mid point of the top edge and tracing a semi circle starting 1/2′ from each edge. After trying a couple of different radiuses I found something which was pleasing to the eye and would allow me to pull any one saw out of the till without getting tangled up with the others. The bulk of the waste was hogged out with a coping saw, and the shape taken down to the line with my Auriou 9 grain cabinet maker’s rasp and 13 grain modellers rasp. I don’t have a plough plane at present (a shocking omission, I know) which would have been my first choice for cutting the slots in the till pieces, nor do I have a router. What I do have however is a Dremel with a router base, which I normally use for cutting inlay recesses on guitars, and a 1/8″ router bit. Double sided sticky tape secured a piece of oak to the till for use as a guide, and I cut the slots with the Dremel. This was predictably slow going as the Dremel is only powerful enough to take very shallow passes at a time, and left a more ragged edge than a router would have. But the end result is good enough for holding saws, and I can always replace the tills with cleaner cut pieces if I want in the future. With the tills shaped and slotted, I broke the wall piece out of the clamps and cleaned up the glue line using my jack plane. To fit the wall I trimmed each end with a No.9 1/2 low angle block plane until the wall was just short enough to drop inside the chest and wedge securely. The saw till will be held in place with cleats, but I want everything to be friction fit as far as possible to avoid any movement. 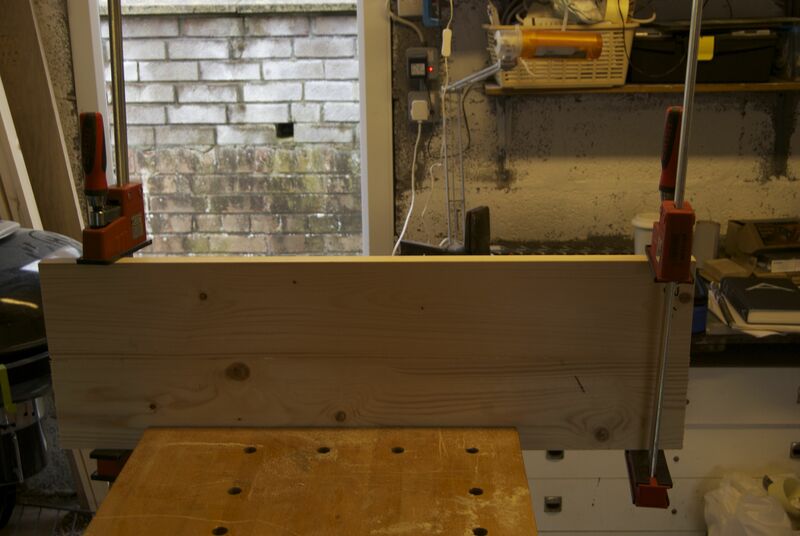 Once the wall fitted across the width of the chest nice and snugly, I screwed the tills to the wall using four No.8 1.5″ brass screws per till, each countersunk to avoid the heads scratching my tools. 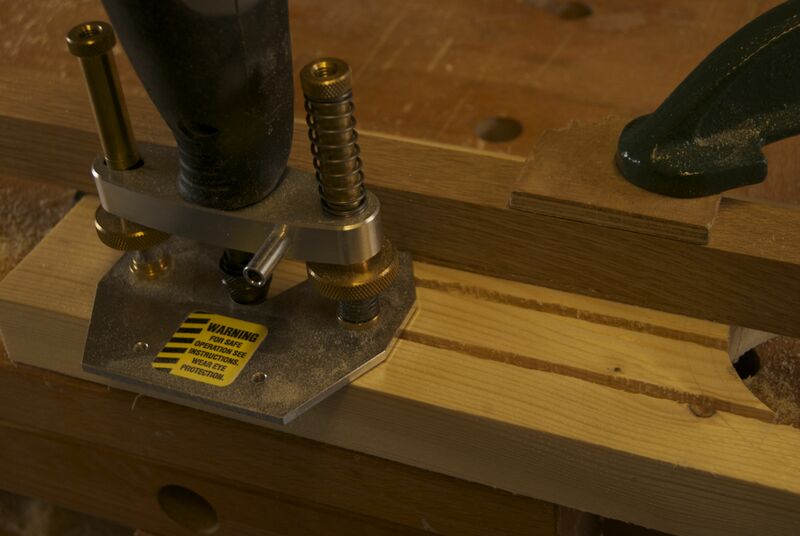 The wall of the moulding plane corral was made from a 1/2″ thick piece of pine which, as with the saw till wall, was cut over length and trimmed with a block plane until it wedged securely across the width of the chest. With the moulding plane corral, the key dimensions are the height of the wall, so that it supports the plane wedges, and also the distance between the wall and the back of the chest, so that the moulding planes can stand on end in the corral. I don’t have any moulding planes yet, but was planning to order some from Philly Planes next year. To make sure that my moulding plane corral fits his planes, I took the liberty of emailing Phil to ask if he could confirm the dimensions to which I needed to build. I was surprised (not to mention very grateful) to receive only a couple of days later not just the dimensions but a full moulding plane sketch with all key dimensions marked out. This level of service towards someone who is not yet a customer is above and beyond the call of duty, and I am very much looking forward to ordering a set of moulding planes from Phil at my earliest opportunity. 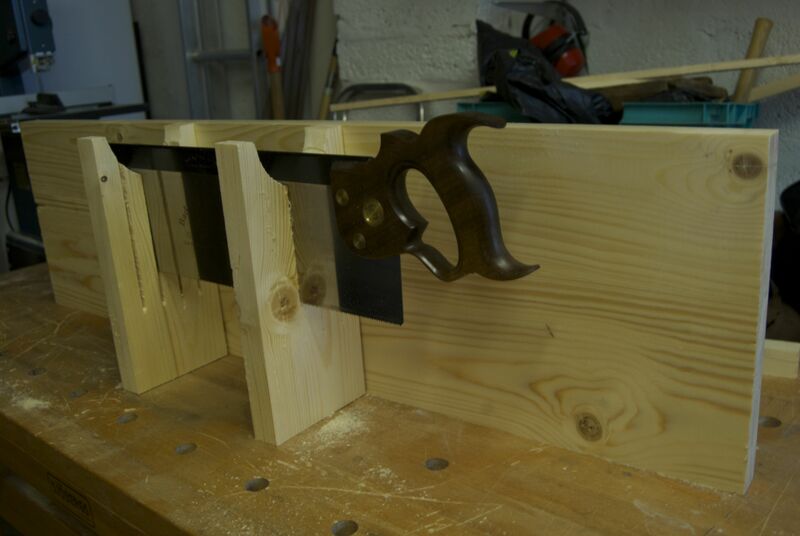 In my next post I will talk about fitting the saw till, moulding plane corral, and tray runners to the chest.